chinadaily.com.cn, 2018-04-26 — When the leaders of the Democratic People’s Republic of Korea and the Republic of Korea meet on April 27, it will be only the third such summit since the end of the Korean War (1950-53). Only a few months ago political tensions were escalating rapidly, raising fears of military confrontation on the Korean Peninsula. It was this dramatic crisis situation of missile launches, nuclear tests and bellicose rhetoric that the world and the 2018 Olympic Winter Games were facing in the autumn of 2017. To understand the easing of the tensions, we need to consider the role of the Olympic Games. It was the power of sports that provided the opening for the DPRK and the ROK to consider dialogue rather than confrontation. The historic moment of the 2018 Winter Olympics in Pyeongchang, the ROK, was when the athletes from the DPRK and ROK marched together as one team at the Opening Ceremony, behind one flag, the Korean Unification Flag. This moment of course did not happen by chance. It was the result of a long process of negotiations and high-level government engagement that the International Olympic Committee began back in 2014, by introducing a special program to support DPRK athletes to qualify for the Pyeongchang Winter Games. But the political tensions on the peninsula escalated significantly during the second half of 2017. The DPRK’s nuclear and missile tests, followed by counter-measures, including sanctions by the United States and the United Nations, raised doubts over the fate of the 2018 Winter Games. Therefore, the IOC intensified its diplomatic efforts with all sides, always maintaining strict political neutrality and emphasizing the fundamental mission of the Olympic Games to bring all people together in peaceful competition. A major part of the IOC’s efforts were focused on the UN’s Olympic Truce resolution — a 3,000-year old tradition revived by the IOC and the UN, to call for a halt to hostilities in the world during the Olympic Games. 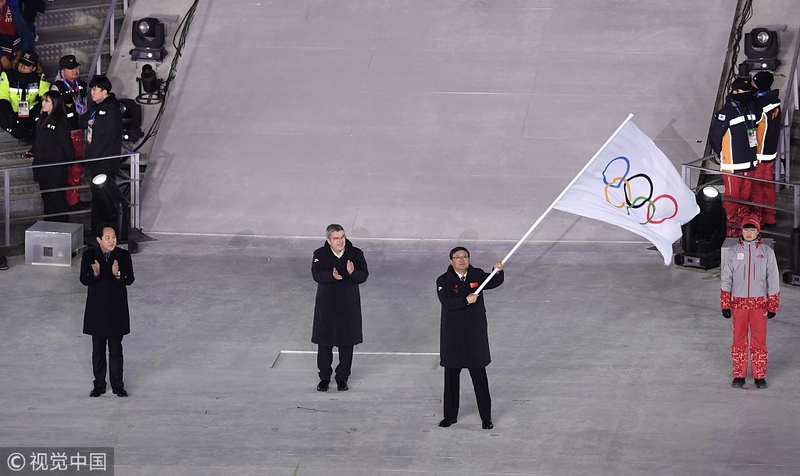 Given the crisis on the peninsula, the IOC, together with the ROK government, incorporated a special section in the resolution to ensure the safe passage of all participants for the Games. After all these joint efforts, the resolution was co-sponsored by a record number of UN member states and adopted by consensus by the UN General Assembly in November 2017. During all of this time, the IOC kept the door open for DPRK athletes to participate in Pyeongchang. The IOC then initiated the “Olympic Korean Peninsula Declaration” with the DPRK and ROK governments and their National Olympic Committees at a meeting on Jan 20, 2018. This declaration made possible not only the participation of the DPRK athletes in Pyeongchang, but also the joint march behind one flag at the Opening Ceremony and the formation of a unified women’s ice hockey team. Based on my personal impressions, having met the leaders of both the DPRK and ROK recently, there are some grounds for cautious optimism for the talks on April 27. In my meeting with the DPRK leader, he said: “The once frozen north-south relations greeted a dramatic thawing season with the Olympics as a momentum and it was totally attributable to the efforts of the IOC which offered an opportunity and paved a path for it”. For his part, the ROK leader always supported the participation of DPRK athletes in Pyeongchang, because he saw the Winter Olympics as a chance to pause the spiral of confrontation and shift the momentum toward peace. The Olympics Games has opened the door. Having walked through this door, the two leaders are about to sit down together at the same table and talk peace. They enter these talks with the shared successful Olympic experience of Pyeongchang. And after my meetings with the two leaders, I am confident both are determined to build on this Olympic momentum. The author is president of International Olympic Committee.